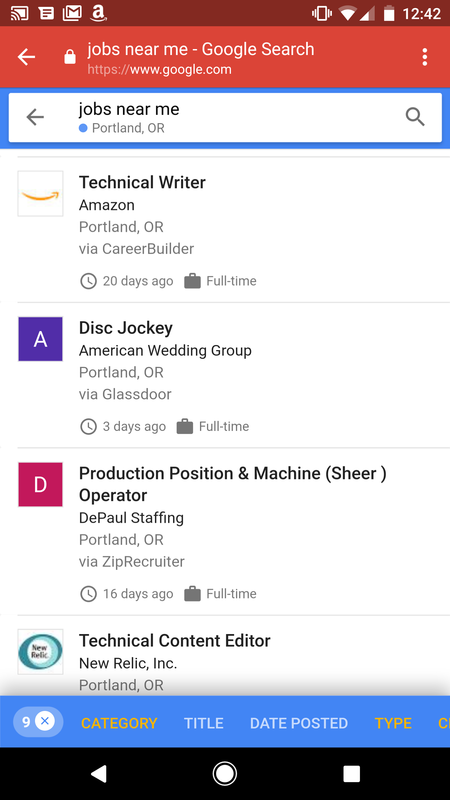 With this new feature, is now available in English on desktop and mobile, all you have to type in is a query like “jobs near me,” “writing jobs” or something along those lines and the search result page will show you the new job search widget that lets you see a broad range of jobs. From there, you can further refine your query to only include full-time positions, for example. When you click through to get more information about a specific job, you also get to see Glassdoor and Indeed ratings for a company. To create this comprehensive list, Google first has to remove all of the duplicate listings that employers post to all of these job sites. Then, its machine learning-trained algorithms sift through and categorize them. These job sites often already use at least some job-specific markup to help search engines understand that something is a job posting (though often, the kind of search engine optimization that worked when Google would only show 10 blue links for this type of query now clutters up the new interface with long, highly detailed job titles, for example). Once you find a job, Google will direct you to the job site to start the actual application process. For jobs that appeared on multiple sites, Google will link you to the one with the most complete job posting. “We hope this will act as an incentive for sites to share all the pertinent details in their listings for job seekers,” a Google spokesperson told me. As for the actual application process itself, Google doesn’t want to get in the way here and it’s not handling any of the process after you have found a job on its service. It’s worth noting that Google doesn’t try to filter jobs based on what it already knows. As Zakrasek quipped, the fact that you like to go fishing doesn’t mean you are looking for a job on a fishing boat, after all. Google is very clear about the fact that it doesn’t want to directly compete with Monster, CareerBuilder and similar sites. It currently has no plans to let employers posts jobs directly to its jobs search engine for example (though that would surely be lucrative). “We want to do what we do best: search,” Zakrasek said. “We want the players in the ecosystem to be more successful.” Anything beyond that is not in Google’s wheelhouse, he added.